The perfect "Beach House" set on a quiet private driveway on the sand dunes of Newton Burrows on the Glamorgan Heritage Coastline in South Wales. Wake up to breathtaking views and sounds of the sea. Secluded sun drenched gardens. Two minute walk through the sand dunes to Newton beach. Ideal family holiday location, romantic breaks, winter breaks, or just to recharge your batteries! Within short walking distance of the historic village of Newton and its 12th Century St John's Church, Village Green, local shops, Post Office, 3 Public Houses, Good choice of Blue Flag beaches. Porthcawl being well known for Surfing/Wind Surfing. Golfing, with many good courses within a short distance, including the Royal Porthcawl Golf Course. 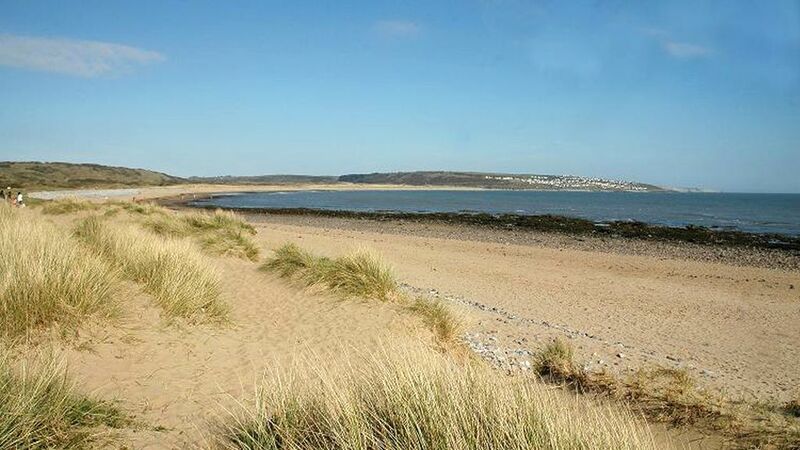 Horse Riding, there is a Riding School in nearby Ogmore-by-sea, enjoy a trek along Ogmore beach. Walking holidays, a good base for touring and sightseeing as the house is set on the Glamorgan Heritage Coastline halfway (30 minutes by car each way) between Cardiff/Cardiff Bay and Swansea/Mumbles. Close to Margam Park and Abbey, St. Fagan's National History Museum. Perfect for Summer and Winter holidays. Ideal for Christmas/New Year breaks. Having spent my childhood holidays in Porthcawl the memories brought me back to look for a property with a sea view. We came across this house and were blown away by its location with Newton beach on the doorstep and being so close to Porthcawl Harbour and Town. Such a good base being halfway between Cardiff and Swansea. The Beach House is set in a mews of 6 houses on a quiet private driveway right on the sand dunes of Newton Beach. Newton beach is a sheltered bay and the walk on the South Wales Glamorgan Heritage Coastline can take you to the pretty village of Merthyr Mawr, Ogmore-by-Sea and Southerndown or, walk along the coastline to Porthcawl town, Rest Bay and walk the boardwalk between the Royal Porthcawl Golf Links and the sea, wonderful sunsets from here. A quiet setting, the beach a 2 minute walk through the sand dunes. Sea views. Sun drenched gardens all day. A very warm and inviting home from home feel. Close to local amenities, a true "Beach House". 10 minute walk or 5 minute drive to Newton Village for local shopping and choice of places to eat or supping a glass or two! The Jolly Sailor being the first Public House to open in Porthcawl in 1818 which also has a very welcoming Restaurant for daytime and evening meals. Fully tiled bathroom, white 3 piece suite wc, sink/vanity unit with large mirror, shaving socket and light over, bath/thermostatic shower over and screen, radiator/heated towel rail, extractor fan, tiled floor. Beach Style living room, oak floor, comfortable sofa & armchairs, fireplace/electric log stove, ample lighting, large flat screen SMART TV with USB PORT & CHROME-CAST, DVD player, DVD's, and reading material. Fitted kitchen, electric oven and hob, fridge/freezer, microwave, cafetière, toaster, kettle, crockery/cutlery, oven-ware, washing machine, iron/ironing board, digital radio with iPod dock and tiled floor. Sunny private gardens front and rear. Front garden has seating, palm tree, shrubs and beach pebbles. Rear garden has seating, plus dining table and chairs with sun umbrella and Summerhouse. SURF SCHOOL:Rest Bay beach(10mins drive from Beach House)Wet Suit&Surf Board hire for adults&children.Excellent beach for surfing.Lifeguard station. Outside showers provided. Also Car Park. Prestigious Royal Porthcawl Links, Rest Bay 10min.drive The Grove with Restaurant 10min.drive Pyle & Kenfig Links Course 15 min.drive. Southern-down Golf Club 20/25min.drive. Coed-Y-Mwstwr Golf Couse, Bridgend 25 min.drive. Celtic Manor Golf Club 45 mins.drive via M4 Motorway - Junction 24. ParkDean Pleasure Park 10 minute drive. Day Passes available for use of indoor and outdoor swimming pools and leisure activities. Car parking available on site. Notes on accommodation: NO SMOKING AND NO PETS. Private parking for 2 cars. Quiet Location. Outside: Front garden is secluded and laid with beach pebbles, palm tree, coastal plants and patio furniture, a sun trap all day and solar lit by night. Secluded sunny back garden, summerhouse, patio dining furniture, beach chairs, etc.,solar lit by night. Back gate leads to private car park for 2 cars. Linen/Towels/Beach Towels provided. Cleaning is carried out before arrival and after departure. No cleaning charge if house is left reasonably clean and tidy. Conservatory, double glazed, heating provided, with Dining table and chairs for 4 persons. Tiled floor. We had a fabulous week at The Beach House. Jackie and Mike were really thoughtful hosts, meeting us at the property when we arrived and leaving really lovely welcome gifts including Easter eggs for our girls who were very chuffed with those! The house is so beautifully furnished and also extremely thoughtfully kitted out with all that we needed to make for a really comfortable and enjoyable stay. In addition to the basics it was things like the travel mugs, picnic ware, beach towels, chairs and buckets and spades that made enjoying the beautiful local beach even easier. We had a lovely week exploring all of the local Porthcawl beaches and enjoying beautiful coastal walks. We would highly recommend this property and would love to revisit in the future perhaps! The beach house was wonderful, everything that you could wish for, Mike and Jackie were so lovely! Everything is so immaculate. Thank you so much Annie and Alan, See you again soon. The property is very well situated, just a short walk over the dunes to the ocean. There are 2 small supermarkets nearby (15 mins walk or short drive) and the Jolly Sailor pub which serves great food. The property is very well equipped, a real bonus not to have to take beach towels. There is also a summerhouse with buckets and spades and space to leave wet shoes, etc. The TV is very modern (we could watch netflicks via my daughter's phone - don't ask me how!) and having a separate dining room means there is plenty of room in both rooms. The hosts were lovely, met us on arrival and supplied lots of useful information about the local area and were available to answer questions throughout the stay if needed. Would thoroughly recommend for families of all ages though I'm tempted to go back without my teenagers and enjoy a bit more of the amazing coastal walk. We had a wonderful stay and would highly recommend it. Beautifully furnished, clean holiday house so close to a quiet beach, wonderful for restful holiday. The owners Mike and Jackie could not have done more to make us feel welcome and at home in their lovely house. Whilst small, it was so well furnished it had very thing you would want for a pace full and relaxed holiday. The location of the property was also really good as you were a couple of minutes walk to a quiet beach over lovely sand dunes, and along the coastline, whilst also close enough to a lovely little pub where you could enjoy a good meal and beer. The house was also in a good spot to be able to tour the area and in fact close to Royal Porthcawl golf club (great walk along the cliffs there) and not far to drive to the Gower Peninsula. A thoroughly enjoyable place to relax with great help and support from the owners. Recommended. This house has been furnished and equipped for the discerning traveller. The owners,Mike and Jackie have obviously put a lot of thought into making this property attractive with small touches that are so welcome. I would recommend The Beach House to anyone who would enjoy a comfortable and delightful holiday home. We had four magic days there and look forward to returning one day . Newton Beach - on your doorstep - 2 minute walk through the sand dunes. Rest Bay - ideal surfing/windsurfing/kitesurfing - 10 minute drive. Sandy/Coney Beach and FunFair - 5 minute drive or 15/20 minute walk. Trecco Bay - 10/15 minute walk. Cardiff/Wales Airport approx.15 miles away. Nearest Rail Stations: Pyle 4 miles and Bridgend 5 miles away approx. To reach Newton by Road take J37 to Porthcawl on the M4 Motorway just 10 minutes drive away. Newton Village 10 min. walk or 5 min.drive. Porthcawl Town/Harbour 10 min. drive or by walking the Heritage Coastline. Newton is set halfway between Cardiff/Cardiff Bay and Swansea/Gower Peninsular just half hour drive in either direction. Merthyr Mawr with its thatched cottages, Ogmore-by-Sea. St.Fagans National History Museum - j33 on M4 Motorway. Bridgend Outlet Shopping - huge discounts! and Odean Cinema complex choice of eateries, good parking. Kenfig National Park, Margam Park, Cowbridge, Llantwit Major, Brecon Beacons. local grocery stores, hairdressers, off-licence, post office. Porthcawl Town/Harbour/Esplanade has its own Theatre, 'The Grand Pavilion' on the Esplanade, Banks, supermarket and local retail shopping. Ideal for walking, surfing/wind surfing, jet skiing, sailing, fishing, golfing and horse riding.